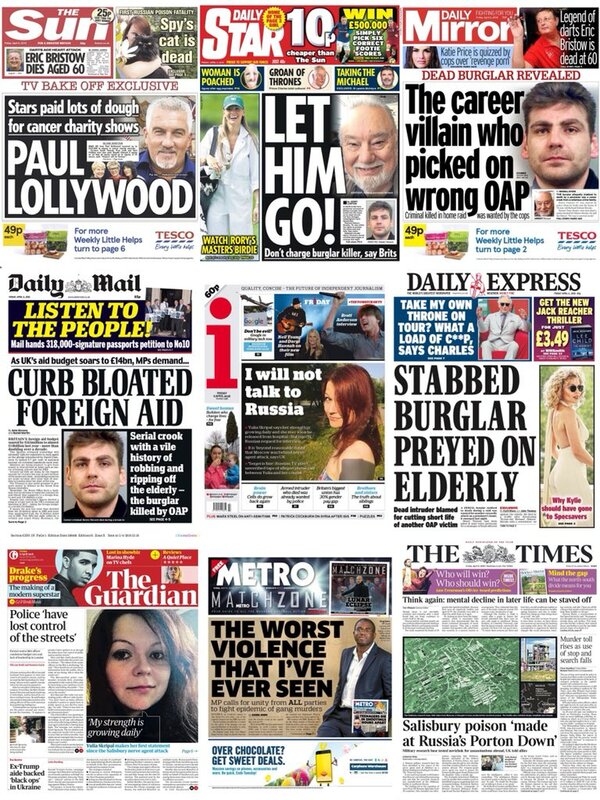 The top scorer in last week’s newsquiz was Liz Gerard with an impressive 20 points. Jamie Johnson’s household was the top team with 19. Janet Boyle scored 18 as did Steven Silk. Graham Dudman and Charlie Coe also reported healthy scores with 17 each, the same as Adam Batstone and Lucy Thorpe. Here is this week’s quiz. As usual there are 25 questions about the week's events. Give it a go and let me know how you get on. 1. A Russian proposal for a joint investigation into the Salisbury poisonings was outvoted at a meeting of the Organisation for the Prohibition of Chemical Weapons in which city? 2. Foreign Secretary Boris Johnson reacted to claims he had misled people over the poisonings by saying: '28 other countries have been so convinced by the UK case they have expelled Russians. In contrast, Jeremy Corbyn chooses to side with the Russian ___ ___.’ What are the two missing words? 3. Labour leader Jeremy Corbyn said he had no regrets about attending a dinner organised by which left-wing Jewish group? 4. Alison Saunders announced she is to step down from which position at the end of her contract in October? 5. UK companies with more than how many staff had to submit their gender pay figures by midnight on Wednesday? 6. After a teenager was stabbed to death in Hackney, the Metropolitan police confirmed it is investigating how many suspected murders since the start of the year? 7. Tory MP Jacob Rees Mogg was sent a 'cease and desist' letter accusing him of ‘masquerading’ as which character? 8. Vauxhall's French parent company PSA announced that a new model of which van would be built at its Luton plant? 9. Nasim Aghdam, 39, shot three people and then killed herself at the YouTube offices in which Californian town? 10. When he stood in the 1984 Chesterfield by-election against Tony Benn, he was asked if voters could take seriously a man who played Selwyn Froggitt. Who was he? 11. Former students in England and Wales, who took out loans from September 2012 onwards, will now start repayments when they earn how much per year? 12. 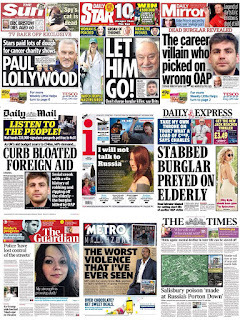 Why was Richard Osborn-Brooks in the headlines? 13. Sergeant Matt Tonroe from Manchester became the first British serving officer to be killed doing what? 14. AC Milan legend Franco Baresi held up a shirt with whose name on it before the derby with Inter Milan on Wednesday? 15. In 1969 prisoner number 1323/69 was jailed for 18 months and kept a diary which was published as a book called 491 Days. Who was the prisoner? 16. Four members of a Bristol family were killed in a car crash in Florida while returning to their rented home after visiting what attraction? 17. What did Jazz Carlin, Eilidh Doyle, Alistair Brownlee and Caroline O'Hanlon all carry this week? 18. Former consultant Martin Watt was jailed for 12 years after being caught with guns and a list of colleagues he blamed for his dismissal from Monklands Hospital in Airdrie. What title did he give the list? 19. Who was 'in good spirits’ at King Edward VII hospital in Marylebone? 20. Who received a 'heartfelt congratulations’ on its 100th anniversary from the Queen who ended her message with the organisation’s own motto Per Ardua ad Astra? 21. Why did Liverpool FC apologise ‘unreservedly’ to Manchester City? 22. The Echo Arena in Liverpool burst into a rendition of 'there's only one ____ ____’ on Thursday night. What are the missing two words? 23. What measure, introduced today (Friday), does the Treasury estimate will raise £240million a year? 24. The Prime Minister of which country joined a social media protest over MasterChef judges John Torode and Gregg Wallace after they said that chicken rendang needed ‘crispy’ skin? 25. What did MP Nadine Dorries says was 'too vicious’ and ‘too abrasive’ for women?